Check-in at Dublin airport for your direct Aer Lingus flight to Santiago de Compostela. On arrival, you will be met by your guide and transferred to your hotel in the UNESCO World Heritage Site of Lugo where you will stay in the 4 star Grand Hotel Lugo for 4 nights with breakfast and dinner. 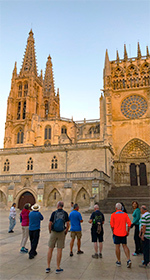 After breakfast depart your hotel with your walk guide for a transfer to the monastery of La Magdalenain on the edge of the old town of Sarria. Here the group will celebrate Mass before taking our first steps of the final 100km of the Camino. On passing the cemetery you cross the �Ponte Aspera� bridge towards a pleasant and peaceful walk through many picturesque villages along quiet country roads shaded by vast oak trees. On the latter stage of the route you can see the ruins of the old monastery of Santa Mar�a de Loyo, the original building of the Order of St James. Enter Portomar�n over the river Mi�o via the modern bridge where you might get a glimpse of the old site of the village. On crossing you can ascend the Escalinata de Nuestra Se�ora de las Nieves, the little chapel at the top of the stairs before taking some time to relax and refresh in the town square before being picked up by your coach and retuning to the hotel for dinner. Enjoy your breakfast at the hotel and take the coach back to Portomarin. Leave Portomarin across the Belesar and around Monte San Antonio towards Ventas de Naron passing through the villages of Gonzar and Castromaior where a small Romanesque Church dedicated to the Virgin is located. On crossing the sierra de Ligonde on the Dorsal Galega (the Galicain Ridge) you enter the farming region of Ulloa where you begin to descend through oak trees and meadows. On your decent the first eucalyptus trees come into view and after Brea you ascend the Alto do Rosario, a traditional point for Pilgrims to stop for prayer, where you can see Monte Pico Sacro the mountain that overlooks Santiago de Compostela on a clear day. Continue into Palas de Rei your finishing point and take time to relax and explore before being collected by your coach and returned to the hotel for dinner. After breakfast you leave your hotel for Palas de Rei via coach. Leaving Palas de Rei you descend towards San Xuli�n crossing over the river Ruxian. Continuing onward through the village of Casanova and many Galician hamlets. Before crossing the R�o Seco over the Magdalena bridge to Disecabo and the mediaeval Puente Velha which spans the R�o Furelos you will reach the main town of Melide. Continue the day through forest tracks, meadows and cornfields till you reach the villages of Boente and Rivadiso before continuing to Arzua. Here you will meet your coach and return to your hotel. This morning you can celebrate Mass with the group in the beautiful Cathedral in Lugo. After you will check out of the Grand Hotel Lugo and take the coach transfer to Arzua. 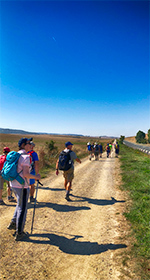 Leave the coach and your bags to begin your days walk of this shaded section of the Camino through more villages and hamlets such as Cortobe, Ferreiros and Santa Irene. You make your way across numerous streams, through woods and along quiet country roads before reaching O Prdrouzo. Here you will be met by your coach and transferred to the 4 Hotel Hesperia Peregrino in Santiago de Compostela where you will be reunited with your bags and checked in for 3 nights. 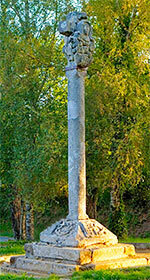 After breakfast you take the coach back to O Pedrouzo and walk via Amenal and Santiago airport to Lavacolla. Here you can follow tradition, by washing in the river to prepare ourselves for our arrival to the Holy City. Continue to Monte do Gozo, the mount of joy, here we will get our first glimpse of the Cathedral like so many pilgrims before. Here we take time to enjoy lunch before continuing to our goal, Santiago de Compostela. Complete your walk at The Obradoiro Square, here you can enjoy your achievement and witness the newly restored Cathedral before entering to venerate at the tomb of St James. After you can collect your certificates with your official Camino Passport or Credencial del Peregrino from your guide. After breakfast we can leave for the Pilgrims Mass at noon in the Church of San Francisco the temporary home of the pilgrim mass due to restoration work. After you can enjoy the rest of the day in Santiago at your leisure, visit the tomb of St. James again, absorb the wonderful architecture of the Cathedral, explore the many narrow cobbled streets and enjoy the Galician cuisine. Return the short distance to the hotel for dinner. Today you have some free time to enjoy before your 2pm transfer to the airport for your flight home. Take the time for one last venture into the Cathedral�s Square or simply take the morning to relax beside the hotel swimming pool.